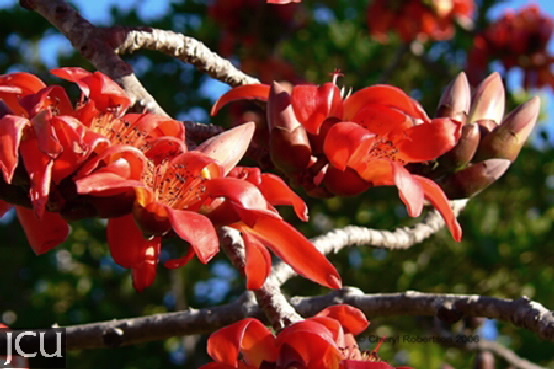 This large deciduous tree is native to Cape York and tropical Asia. The trunk and branches bear numerous conical spines particularly when young. The leaves are palmate with about 6 leaflets radiating from a central point, the petiole is up to 16 cm long. In spring the tree is covered in large cup-shaped red flowers to 20 cm diameter and these are filled with copious nectar. The numerous stamens have red filaments and are tipped with black anthers. The fruit is a brown capsule to 15 mm long, filled with numerous black seeds that are covered in fine silky hairs. New leaves usually do not appear until flowering is over. Although each flower only lasts for one day they are visited by numerous birds seeking the nectar. Birds have been observed to get drunk on the fermenting nectar!